Step inside and revel the intimacy of your own private sanctuary. Befitting the most romantic luxury hotel in Tuscany, each suite is unique. Antique details, such as wooden beams, stone floors and metalwork accents, honour the estate’s rich history. Crisp fabrics, state of the art amenities and splashes of colour add a level of contemporary sophistication. Enter into the upstairs living area, featuring two-storey ceiling-to-floor windows. The master bedroom is located on the lower level, which opens out to a stunning private garden terrace. The spacious Grandiosa Suites are refined and sophisticated with a separate sitting area. Wood beam ceilings and local antiques sit beside vibrant Italian fabrics. Views of the interior courtyard or surrounding countryside are sure to enchant. 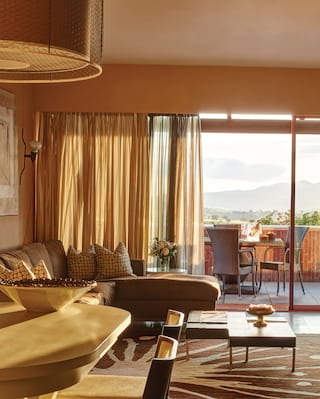 Inspired by modern Italian design, the Oliveto Suites take full advantage of the beautiful surroundings and incredible valley views. Just a short stroll to the main castle, they blend rustic Tuscan charm with contemporary Italian flair. They feature a bedroom with a separate living room plus a large, private outdoor terrace. Found within the hotel’s historical building, each of these suites is filled with local antiques and rich Italian fabrics. They offer enchanting views across the Tuscan hills or the beautiful San Tommaso Chapel. Go all out on luxury. Book a Junior Suite or Suite and anticipate an unforgettable escape in the hills of Siena.